The greenhouse effect was first discovered by Jean-Baptiste Joseph Fourier a French mathematician. In the 1820s Fourier calculated that an object the size of the Earth at the Earth's distance from the sun, should be considerably colder than it is, if only warmed by incoming solar radiation. He never found out exactly why this was but he speculated that the atmosphere acted as a blanket to slow the rate of heat escaping. Global climate change is not a new idea. In 1896, Svante Arrhenius, a chemist who became Sweden's first Nobel prizewinner, published rough calculations showing that doubling CO2 levels would trigger a temperature rise of about 5-6C. Almost in passing, he estimated that coal burning at the rate applicable in 1896 would drive a steady rise in CO2 levels of about 50% in 3,000 years, a prospect he found entirely rosy. However, the world population was only 1.6 billion at the time and most travel was by horse, sailing ship or by steam train. I think it is safe to say that Arrhenius was not supporting a political agenda on behalf of China. In 1900, shortly after Svante Arrhenius published his calculation showing that the use of fossil fuels will eventually warm the planet, another scientist, Knut Ångström, published the result of a simple experiment. His assistant sent infrared radiation through a tube filled with carbon dioxide. The tube contained a small fraction of the CO2 that would be found in a column of air reaching to the top of the atmosphere. Ångström reported that when he cut the amount of gas in the tube by one-third, the amount of transmitted radiation hardly changed. He argued that this showed that all of the infrared radiation was already being absorbed and adding more CO2 would have no effect. The American meteorological community was alerted to Ångström’s result in the June, 1901 issue of Monthly Weather Review, which cautioned scientists against investigating to Arrhenius’ wild theories with the admonition, "The geologists who have adopted Arrhenius’s views should recall that his hypothesis evidently fails in the light of present knowledge of the absorptive powers of carbon dioxid." The argument presented was so convincing that it delayed any serious research into the greenhouse effect for more than 50 years. Sadly, this argument continues to find credence with the uninformed even today. In 1938, a British steam Engineer, Guy Stewart Callendar compiled measurements of temperatures from the 19th century on, and correlated these measurements with old measurements of atmospheric CO2 concentrations. He concluded that over the previous fifty years the global land temperatures had increased, and proposed that this increase could be explained as an effect of the increase in carbon dioxide. These estimates have now been shown to be remarkably accurate. But like the results published by Svante Arrhenius, his results were largely discounted at the time. This web site is intended to present the science behind global climate change. It is not a political site. It simply presents known, well established, scientific facts and ties them together to show why increasing the concentration of greenhouse gasses in the atmosphere will cause the earth's surface (land, oceans and ice sheets) and the lower atmosphere to warm. There are some simplifications made and these are clearly pointed out. These are made to avoid complex mathematics which some readers may not be able to follow and are not germane to the argument. None of the simplifications will change the resulting conclusions. There are also a number of assumptions made. These are also clearly pointed out. There are some calculations shown but these should be well understood by anyone who has completed high school science courses. We will start with the basics - What is a greenhouse gas? 2.0 What is a Greenhouse Gas? A greenhouse gas is one that is transparent to visible light but opaque to at least some frequencies of infrared radiation. 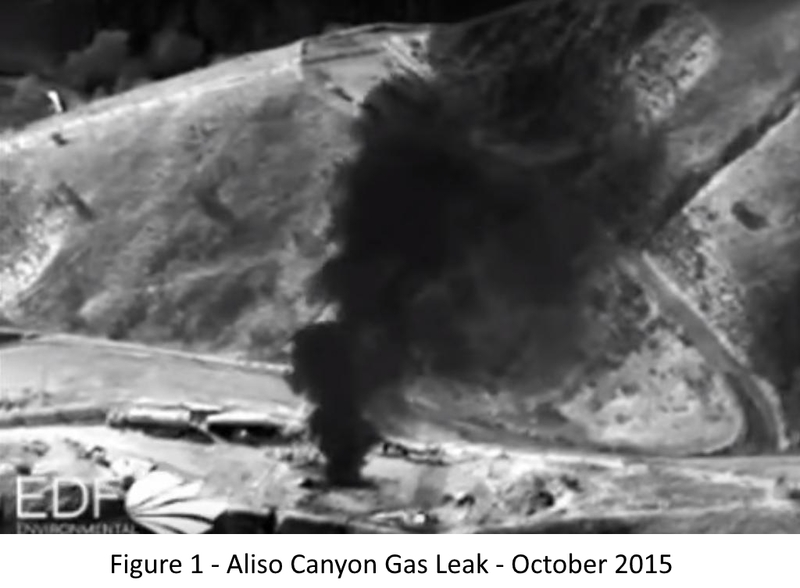 Figure 1 is an infrared image of the gas leak at the Aliso Canyon storage facility in California that took place in October 2015. The gas escaping is about 98% methane, which to the human eye is a colorless gas. In the infrared image below, the methane appears black. If methane were transparent to infrared radiation, as it is to visible light, we would see the details behind the cloud with only a slight distortion due to the differences in density between methane and air. But at least in the core of the cloud, all of the infrared radiation is absorbed, making it appear opaque. Since the cloud is cold compared to the surroundings, it appears black in the photograph. Methane is a greenhouse gas. Visible light passes right through it like it passes through air, but infrared light is absorbed, blocking the view of anything behind it. It is this property that makes methane, and other gasses such as carbon dioxide and water vapor, greenhouse gasses. They act like a one-way valve for energy from the sun. The absorption of infrared light by a greenhouse gas is not like light being blocked by a wall. It is more like the effect we see when we are in a fog. We can see things that are close very clearly, things a short distance away appear less distinct and things that are a long way away are invisible. The absorption of light and infrared radiation obey the same rule. If the absorbing media absorbs X% of the light in the first Y feet, then it will absorb X% of the remaining light in the next Y feet. So if 50% of the infrared light is absorbed in the first 10 feet of a greenhouse gas rich environment, then 50% of the remaining 50% will absorbed in the next 10 feet and so on. The forgoing uses methane to demonstrate how a greenhouse gas works, but the primary gas of interest, at least for the moment, is Carbon Dioxide. Next we will examine Infrared Radiation. 3.0 What Is Infrared Light? Infrared light (or infrared radiation) is long wavelength light that is invisible to the human eye. 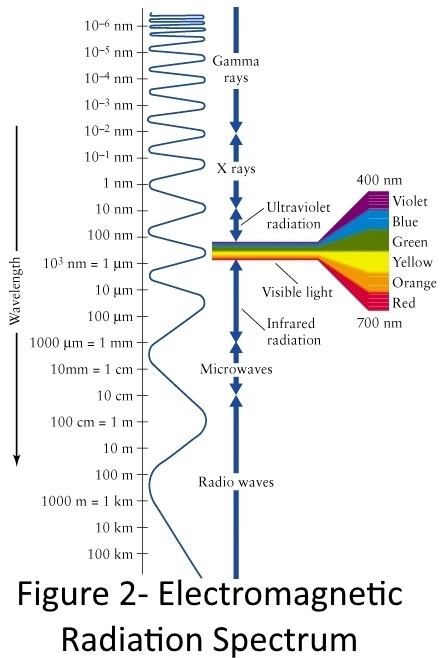 Infrared radiation has a longer wavelength, between 700 nanometers and 1,000,000 nanometers (which is a millimeter). Infrared radiation was discovered in 1800 by Sir Frederick William Herschel, a German astronomer. He set up an experiment to determine the relative energy provided by different colors of the solar spectrum. He placed thermometers in the path of the main colors of the spectrum At the side, where there was no color visible, he placed a thermometer as a control, reasoning that it would not receive any energy from the sun. To his surprise, the control thermometer registered the largest temperature rise, indicating the arrival of energy in a form that he could not see. Not all wavelengths of infrared light are absorbed by every greenhouse gas. Each gas absorbs light of certain wavelengths called absorption bands. The wavelengths that are not absorbed are sometimes called "windows" in the absorption spectrum. 4.0 How Much CO2 Is In The Atmosphere? 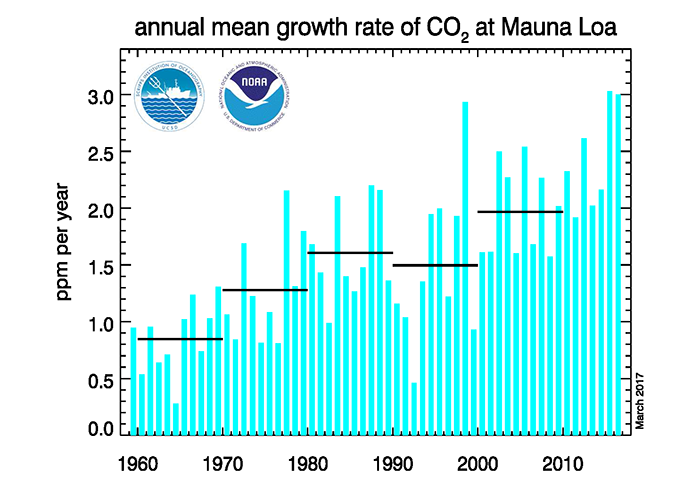 The image at the right shows the carbon dioxide concentration (Blue line) in parts per million as a function of time. Because the molecular weight of CO2 (44) is higher than the average molecular weight of air (29), by weight, these concentrations are (280*44/29 = ) 424 parts per million and (400*44/29 = ) 607 parts per million by weight. Parts per million does not sound like much but there is a lot of atmosphere above us. Based on (one of the many) standard atmospheres, the average atmospheric pressure at sea level is 14.73 psi (pounds per square inch) or 2121 psf (pounds per square foot). This pressure is due to the weight of the atmosphere above. Thus we know that above every square foot of the earths surface (at sea level) there were (.000424*2121 = ) 0.899 pounds of CO2 in the pre-industrial age and (.000607*2121 = ) 1.287 pounds of CO2 today. The amount of CO2 in the atmosphere in 1700 was only about 69% of what it is today. You will notice in the figure to the right that CO2 is not the only greenhouse gas that we are adding to the atmosphere. Others include methane and CFCs (Chlorinated Fluorocarbons). But we will concentrate on CO2 to keep things simple. We now know what a greenhouse gas is, what infrared light is and how much CO2 there is in the atmosphere. Now we will examine how radiation energy transfer works. 5.0 How Does Heat Energy Transfer Work? In the normal world, there are three basic mechanisms for heat transfer: Conduction, Convection and Radiation. Where Q = the heat flux (Watts/hr. ), T1 and T2 are the cold and hot temperatures and k is the thermal conductance of the system. k is a constant for any given geometry. When we insulate houses, we talk about the R-value. This is just 1/k on a per square foot basis. Convection is the movement of heat through the movement of liquid or gas. Smoke rising from a camp fire is carried up by a convection current that carries the heat of the fire using the air. Water boiling in a pot is another example of convection at work. The equation for convection is very similar to the equation for conduction in that the heat transfer rate is proportional to the temperature difference between the hot and cold. Convection is the main method of transferring heat around in the lower atmosphere. Radiation heat transfer is the transfer of energy by electromagnetic radiation. When we feel the heat of the sun on our skin, that is radiation heat transfer. When we feel the heat of a bonfire, that is radiation heat transfer. Radiation is a whole different animal from conduction or convection. It does not require a physical medium to operate. In fact, a physical medium in the path of radiation heat transfer slows it down. Radiation is different in other ways. First, the rate of heat transfer is not just dependent on the temperature difference but on the temperatures themselves. For example, for two bodies at 60F and 80F, (Th4 - Tc4) = 11.9x109. For the same two bodies at 80F and 100F, the value is 15.3x109, a difference of 29%, even though the temperature differences are the same. Radiation heat transfer from the ground to space passes through the atmosphere. The CO2 makes the atmosphere opaque to infrared light so we must examine how the infrared energy makes its way to space. If one side of an opaque gas cloud is hot and the other is cold, radiation will heat the cold side by a series of absorptions and re-radiations by molecules inside the gas cloud without any of the gas moving. This is important in our atmosphere because as greenhouse gasses absorb heat, they transfer this heat to other gasses and together they re-radiate energy in all directions. This is one of the main heat transfer mechanisms for transporting heat to the upper atmosphere where it can be radiated out to space. Figure 4 shows a horizontal column of greenhouse gas. It is horizontal so that the pressure is the same at each point. The transfer of energy through a cloud of gas by absorption and re-radiation can be divided into three zones as shown in Figure 4. The first is the zone of primary absorption. If we shine infrared light into a column of gas from the left, and immediately measure the absorption with distance, we will find a point where the radiation flux is vanishingly small. If we move an infrared camera along the path of the light, the image of the source will become less and less distinct as the distance increases. This is because, at each point along the column, some photons were able to travel the distance from the source to the camera without being absorbed by a gas molecule. But as the distance increases, more and more photons are absorbed by gas molecules. If we do the experiment very quickly, the infrared radiation will not have time to warm up the gas in the column and none of the energy absorbed by the primary zone will be transferred to the other end of the column. The second is the zone of absorption/re-emission. In this portion of the gas column, each molecule of gas that absorbs a photon re-radiates the photon in a random direction. These photons will be re-absorbed by other molecules and the energy will spread in all directions. If we shine an infrared light into a gas column and wait for a while, the radiation will cause the gas to warm along its length. In the portion of the gas column where only absorption/re-radiation occurs, an infrared camera will not see the image of the source because the light comes from all directions. If the temperatures at the ends of the gas column are kept constant, this zone will eventually exhibit a constant temperature gradient. The third or terminal zone is similar to the primary absorption zone in that some photons can traverse this portion of the gas column without being absorbed. At the beginning of this zone, only a few photons emitted are able to reach the end of the column but as we move along the column, more and more photons are able to make the trip without being absorbed. Because of this, for much of this zone of the gas column, the infrared energy flux and the temperature of the gas are not directly related. Some energy can pass through this stage as if the gas was not there. It is important to understand that at equilibrium, the amount of energy entering the tube is exactly the same as the amount of energy leaving the tube, regardless of the amount of CO2 in the tube. This principle, the conservation of energy, was ignored by Knut Ångström when interpreting the results of his assistant's experiment. 6.0 How Effective Is CO2 At Absorbing Infrared Radiation? Below is a video of an experiment demonstrating the absorption of infrared by CO2. From the video, it appears that the tube is roughly 30 inches long. It is assumed that CO2 has replaced all of the air by the end of the demonstration and that the temperature of the CO2 is about 60F. It is also assumed that the demonstration took place at a location close to sea level. Since a faint image of the candle flame was still visible at the end of the demonstration, it is assumed that 90% of the Infrared radiation emitted by the flame was absorbed by the CO2 in the tube. Since this is less than 100%, the absorption is all taking place in the primary zone. Since the tube was 2.5 ft long, each square foot of tube area contained (0.1162*2.5 = ) 0.29 pounds of CO2/ft2. Now we are in a position to show why increasing the concentration of CO2 in the atmosphere causes warming of the earth. 7.0 Why Does Increasing CO2 Cause Global Warming? In the previous section we saw that a 1 ft2 column of gas containing 0.29 lb of CO2 can absorb 90% of the incident infrared radiation. In a previous section we showed that a 1 ft2 column of the pre-industrial atmosphere contained 0.899 lb of CO2 and that today a 1 ft2 column of atmosphere contains 1.287 lb of CO2. This means that for the pre-industrial atmosphere, 90% primary absorption of infrared radiation from the ground required the first (0.29/0.899 = ) 0.322 or 32.2% of the atmosphere. Today it requires only the first (0.29/1.287 = ) 0.225 or 22.5% of the atmosphere to absorb the identical amount of radiation. Thus infrared heat flux that used to be absorbed by roughly the lower third of the atmosphere is now being absorbed by less than a quarter of the atmosphere. Assuming that all else remains the same, this has two effects. The lower part of the atmosphere (first 22.5%) is warmed more than it was in the past by primary absorption and the upper atmosphere (the next 32.2%-22.5% = 9.7%), which is now receiving less primary radiation, is warmed less. Physics tells us that if the earth is warming due to the accumulation of CO2, the upper atmosphere will be cooled. While scientists are using numerical models to attempt to predict what will happen to various parts of the earth, and to establish a timetable, one thing is certain. As long as the upper atmosphere remains cooler than the equilibrium temperature, the earth will continue to gain energy. Nature will do what it will with the excess heat but the earth will continue to heat up as long as the upper atmosphere remains cooled. 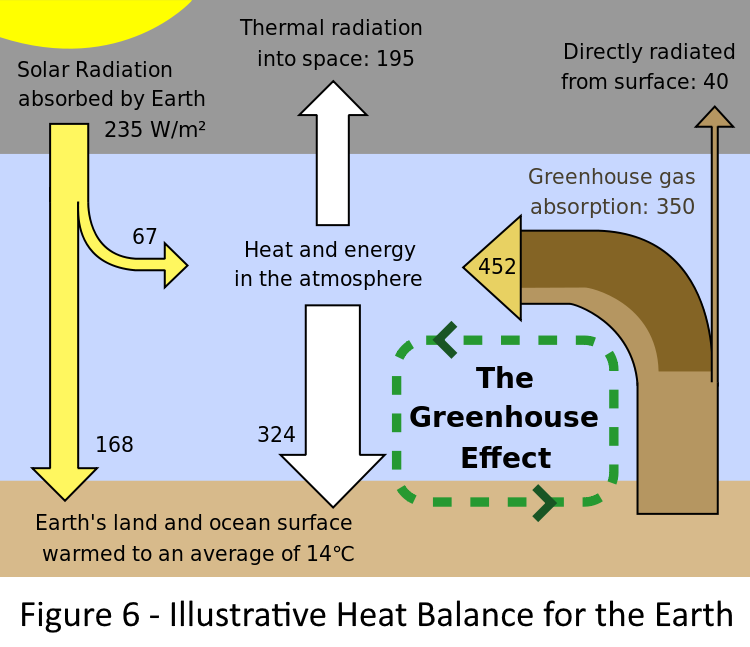 The energy balance can only be restored by raising the average temperature of the earth's surface. The reduction of the volume of atmospheric gas that absorbs the primary infrared radiation from the ground due to the increase in atmospheric greenhouse gases is the driving mechanism for increasing the average temperature of the earths atmosphere. This is exactly like putting an extra blanket over the whole earth and is the mechanism that causes global warming. The warmer air reduces the radiation from the ground because the temperature difference between the ground (which includes oceans and glaciers as well as land) and the air is reduced. If less heat is radiated away from the ground, it has to become warmer. Ice responds to this increased available energy by melting rather than getting warmer. Since vast areas of the earth's surface are frozen, melting ice provides a moderating influence of the rate of global warming. Climate change skeptics have claimed that since the CO2 in the atmosphere was 100% absorbed in pre-industrial times, that increasing the CO2 level would have not effect. They say that the atmosphere has reached saturation. This was Ångström's argument. But the fact is that climate change due to increased levels of greenhouse gases results from 100% primary absorption happening within the lower atmosphere. Heating of the lower atmosphere and cooling of the upper atmosphere is a transient phenomenon as you will see in the following sections. If the CO2 content of the atmosphere had jumped from per-industrial levels to the current levels over night, the affect would have been dramatic. But it happened over a period of more than century. The slow (in human terms) increase in the CO2 levels has allowed the atmosphere to appear to maintain a near equilibrium energy balance. The attempt by the system to return to equilibrium has resulted in a warming of the entire portion of the atmosphere called the Troposphere, the part we live in. 8.0 What Is The Earth's Energy Balance? In order for any system to maintain thermal equilibrium, it must balance energy gains with energy losses. This is true for the earth. The diagram at the right shows a simplified daily energy balance for the earth in graphic form. The energy flows are shown in terms of Watts per Square Meter (W/m2). The diagram shows that each square meter of the earth receives 235 Watts of energy from the sun each day. This happens no matter what we do to the earth's atmosphere. Most of this is visible light but the earth also receives some ultraviolet and infrared light from the sun as well. The diagram also shows that (195 + 40 = ) 235 Watts are lost to space by radiation from the upper atmosphere and by direct radiation from the surface. Direct radiation is mostly reflections from snow at the poles, glaciers, snow covered ground and reflections from light colored ground (beaches and deserts) and radiation through "windows" in the atmosphere's absorption spectrum. Of the 235 Watts incident on the atmosphere, 67 Watts are absorbed in the upper atmosphere because part of the sun's radiant energy arrives as infrared that is absorbed on the way down. So what we have to play with is 168 Watts/m2 that reaches the ground and warms it up. This amount of incoming energy is the same regardless of elevation. At a given latitude, a sandy ocean beach and a mountain top both receive the same amount of energy. There is a note about greenhouse gasses absorbing 350 Watts/m2. Just ignore that for now. The next part gets a bit complicated. What happens depends on the elevation so we are going to assume that the author of this diagram lived in a location close to sea level. The 168 Watts of energy arriving each day is like the flame under a pot of water on a gas stove. At equilibrium, it is just enough energy to keep the water warm but all sorts of things are going on with the water in the pot. So it is with our atmosphere. 168 Watts arrives at a surface that is, on average, 14C (57F). Since the surface is above absolute zero, it radiates energy. In the diagram, heat from radiation and other sources puts 492 Watts/m2 into the atmosphere from the earths surface. The radiation portion is called primary radiation as it is the amount of radiation that leaves the surface. Of this, 40 Watts/m2 is radiated directly to space because it is of a wavelength that is not blocked by CO2 or other gasses. 195 Watts/m2 is radiated into space through the mechanism of secondary radiation (i.e. re-radiation from within the atmosphere that heats cooler gases at higher elevations.) 324Watts/m2 is transferred back to the earth's surface by various mechanisms including radiation. Thus considering only space, the net energy flux is zero (235 - (195+40)). Considering only the atmosphere, the net flux is zero ( (67+452) - (324+195)). Similarly for the earths surface the net flux is zero ((168+324)-452). The earth in this diagram is at equilibrium and will neither get warmer nor cooler. So lets bump up the CO2 in the atmosphere just a tiny bit. The immediate effect is for the lower atmosphere to warm up slightly because a smaller portion of the lower atmosphere is now absorbing the same amount of infrared energy being radiated by the warm soil. For a small increment in CO2, this effect is small but because this state of non-equilibrium cannot continue, it causes several things to happen. The whole system tries to return to equilibrium The lower atmosphere gets warmer, thus increasing the radiation flux to the upper atmosphere and to the surface. The temperature of the upper atmosphere increases to the point where it restores the balance of radiation to space. But this temperature rise forces the temperature of the lower atmosphere to rise in order to maintain the energy flux into the upper atmosphere. When the system again reaches equilibrium, the difference will be a slight increase in the surface temperature, a slight increase in the air temperature and a slightly higher rate of recycling of energy within the atmosphere (e.g. 452 Watts/m2 may increase to 453 and 324 Watts/m2 may increase to 325). A slight increase in the surface temperature causes the frost line to move very slightly toward the poles and to slightly higher elevations in mountainous areas. This decreases the area of reflective snow and ice and increases the area of darker land and ocean. The darker surface absorbs more of the incident radiation, causing a slight increase in the temperature of the land and oceans. This is called a positive feedback mechanism. When the frost line moves towards the poles and to higher elevations, each year an additional amount of ice and snow are melted. This takes a long time to happen, even for a very small increment of greenhouse gasses. Thus the overall effect of the small increase takes years to make itself known and for the earth to reach a new equilibrium. 9.0 How Far Up Is 22.5% of the Atmosphere? To what elevation above sea level do we have to go to be above 22.5% of the atmosphere? (100% - 22.5% = ) 77.5% of 14.73 psi is 11.4 psi. This pressure occurs in the standard atmosphere at an elevation of about 6850 feet (1.30 miles). If our calculations are correct, if we placed the camera from the lab experiment above at this elevation and pointed it down, it would see a very faint image of the surface and if pointed up would see only a fog. This corresponds to the Primary Absorption Zone in Figure 4. Similarly, from the top of the atmosphere, looking down from space, the camera can just barely see through the top 22.5% of the modern atmosphere. The atmospheric pressure at the bottom of this zone would be 22.5% of 14.73 = 3.31 psi. This pressure occurs in the standard atmosphere at an elevation of 38,000 ft (7.20 miles). This corresponds approximately to the top of the troposphere, the lower portion of the atmosphere as shown in Figure 7 to the right. The portion of the atmosphere above this elevation is the terminal zone for infrared radiation headed for space (and the primary absorption zone by CO2 for infrared radiation arriving from the sun). Between the Stratosphere and the Troposphere is the Tropopause. This is a zone where the temperature does not change much with elevation. Since pressure drops very rapidly with increasing elevation, most of the top 22.5% of the atmosphere is in this zone. Assuming what has been presented so far is correct, if we took the infrared camera into earth orbit and pointed it towards the earth, the earth should appear shrouded in clouds . And as shown in the video in the Section 10, that is exactly how it appears. Based only one known facts about Infrared Radiation, how it is absorbed by CO2 and transmitted through at atmosphere, the prediction was made that the infrared image of the earth from space would resemble an image of Venus, a cloud shrouded planet with no view of the surface. This prediction was based on the results of an experiment done using a 30 inch long tube, a candle and an infrared camera and some very simple calculations based on known, irrefutable facts. Figure 8 below is a YouTube version of a NASA video that shows exactly that image. In the image, dark areas indicate cold gasses and light areas indicate warm gasses. The images are from NASA. Up to this point we have only dealt with CO2. This gas is long lived in the atmosphere and exists above the triple point everywhere in the earths atmosphere. This means that there is no place on the surface of the earth where CO2 can exist as a liquid or a solid. Except for locally caused higher concentrations, the CO2 content of the earths atmospheres is quite uniform. But CO2 is not the most important Green House Gas. That distinction belongs to water vapor. However, water can exist as a gas, a liquid or a solid in the range of conditions found on earth and these conditions are constantly changing. It is difficult to measure the average water vapor content of the atmosphere or show that it is increasing or decreasing by direct measurement. But we know that the effect of CO2 is additive to the greenhouse effects of water vapor and we know that a warmer atmosphere can hold more water vapor. The video above shows the effect of all greenhouse gasses on the appearance of the earth from space in the infrared, not just the effect of CO2. In Section 7.0 we showed how increasing the concentration of CO2 in the atmosphere resulted in a reduction in the thickness of the zone of primary absorption of infrared radiation from the earth's surface. In this section we will take a look at what happens to the temperatures and energy flux in the atmosphere as a result of this change and how the rest of the earths systems respond. 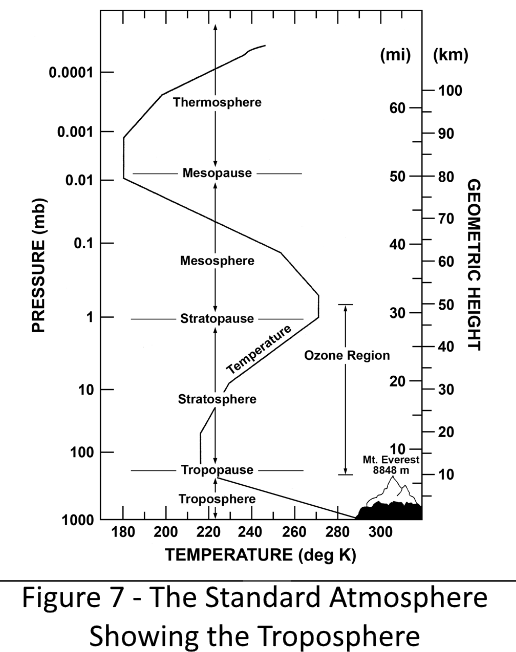 Figure 7 shows the temperature variation with altitude of the lower portion of the atmosphere called the Troposphere. The diagram shows the variation of temperature is linear with elevation. The rate of change of temperature with elevation is termed the "laps rate". The reason that the temperature is linear with elevation is convection. The Troposphere's linear laps rate is due to the cooling of air as it rises. If a body of air is warmer that the air around it, it will rise until its temperature matches the temperature of the surrounding air. We see this on sunny days as fluffy white flat bottomed clouds. The air rises and cools to the point where water vapor condenses and then rises further, dropping out additional moisture, until its temperature matches the temperature of the air around it. In storms, the tops of the clouds are normally limited to the top of the Troposphere but some really violent storms do reach further into the Tropopause. The process described above is convection heat transfer. This process is stopped at the bottom of the Tropopause because the laps rate of the Tropopause is close to zero. 12.0 No. It isn't volcanoes! It's Definitely Us! The foregoing has demonstrated the mechanism for increasing the earth's surface temperature as a result of increased levels of CO2 in the atmosphere. We haven't attempted to calculate the expected temperature rise that will result. We will leave that to the scientists who have dedicated their lives to studying this problem. But in this section we will show where the extra carbon dioxide is coming from. The scientific community is nearly unanimously agrees that the unprecedented rapid size in the CO2 concentration in our atmosphere is due to human activities. There are 7.5 billion people in the world and while many live a very low energy existence, the living standards and thus the food, housing and energy demands of an ever growing proportion of the worlds population is putting CO2 into the atmosphere at an ever increasing rate. Some people claim that the increase in CO2 in the atmosphere is due to natural processes and that humanity is not to blame. One supposed source of all of this extra CO2 is volcanoes. The current (2017) rate of release of CO2 from burning fossil fuels is 36 gigatons per year. The current population of the earth is 7,515,284,153. So this year, for every man, woman and child on the face of the earth, about 4.8 tons of CO2 will be released into the atmosphere just from burning fossil fuels. Does that seem excessive? Typically, gasoline used in cars has an average molecular weight of about 100 which is the molecular weight of heptane. Heptane molecules, contain 7 carbon atoms and 16 hydrogen atoms. Burning this molecule produces 7 molecules of CO2. On a weight basis, every 100 pounds of heptane burned yields 328 pounds of CO2. Thus if heptane was the only fuel, 4.8 tons of CO2 would require that we burn 1.463 tons or 2926 pounds of it. Heptane has a density of 5.81 pounds per US gallon. So 100 pounds of gasoline would be about 17 US gallons of fuel. If that is the typical gasoline purchase, then each person would have to fill their car (2926/100) 29.26 times each year to produce the required.4.8 tons of CO2. Of course, not everyone has a car, but in developed countries, many people produce more that 4.8 tons of CO2 per year just by commuting to and from work. Fuel is burned for many other reasons than just going to work or to the neighborhood mall. 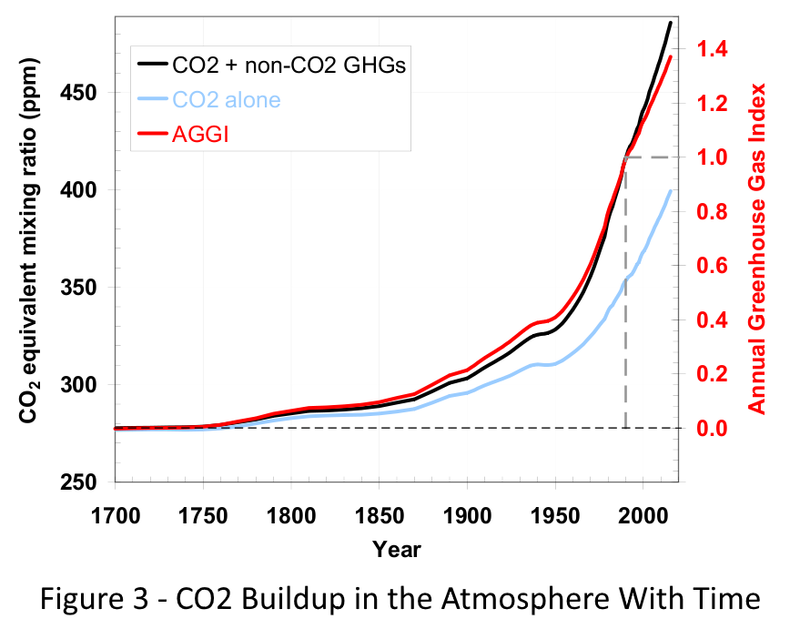 The point is that this rate of emission of CO2 is well within the realm of human scale activity. So it is safe to conclude that the annual release of 36 gigatons of CO2 from all sources is easily achievable by the human race. The terms cement and concrete are often used interchangeably but cement is used here to denote Portland Cement, a grey powder used to make concrete. Data from 2015 show that 0.55 tons of cement were used for every person on earth. That required the production of 4.18 billion short tons of cement worldwide. Cement production releases CO2 into the atmosphere from two sources, the burning of fossil fuels, which we will deal with separately, and the production of lime from limestone. Depending on who you believe, production of lime releases about 0.6 tons of CO2 per ton of cement produced. In 2015 that would have meant the release of 2.5 gigatons of CO2. Changes in land use typically means removing forests for farms, draining wetlands for farms, and building cities over formerly productive land. Any numbers dealing with CO2 release or absorption as the result of changes in land use are estimates and they vary a great deal depending on the researcher doing the estimate. IPCC's latest published estimate is 1.1 petagrams (gigatons metric) of carbon per year. Carbon has a molecular weight of 12 while CO2 has a molecular weight of 44. So 1.1 petagrams is (1.1x44/12) = 4.03 gigatons (metric) of CO2 or 4.44 billion short tons of CO2 per year. There is of course a limit to how much forest can be destroyed, grasslands turned to desert and wetlands drained. So unlike CO2 from fossil fuels, this rate of addition is likely to diminish in the future. Volcanoes are that last refuge for climate change deniers. First off, volcanoes have been around for a long, long time: from well before man began to burn fossil fuels. So it is reasonable to assume that, all else remaining equal, the earth is at equilibrium with the average output of volcanoes. Volcanic activity does vary from time to time and large eruptions have resulted in changes in weather patterns lasting several years. However, on average the amount released by volcanoes is about 10% of the amount of CO2 emitted by burning fossil fuels. The latest IPCC estimate is 0.1 petagrams of carbon or about 4.03 billion tones of CO2 per year. The entire atmosphere weighs (1.135×1019 lb)567.6 x 1013 tons. 3.8 parts per million would be (567.6 x 1013 x 3.8/106 = ) 21.565x 109 or 21.565 gigatons of carbon dioxide per year. The total contribution from fossil fuels, cement production and land use is 42.94 gigatons of carbon dioxide per year. So the annual increase in CO2 in the atmosphere is only about 50.2% of the amount put into the atmosphere by human activity. The rest is absorbed by the earths systems. The systems that absorb some of the CO2 we produce are called "sinks". The most important CO2 sink is the earth's oceans.